After a Vitrectomy, Macular Hole, or Retinal Detachment eye surgery, patients may need face down recovery equipment to promote proper healing of the eye. The thought of staying face down all day and night can be daunting. How will you eat, sleep, read, watch TV and visit with family? Easy! Our face down recovery equipment rental package contains everything needed for comfortable face down compliance. Our Vitrectomy recovery set includes a face down recovery chair, face down face support, a mirror, extra pads, pad covers and other accessories to support a successful recovery. Comfort Solutions offers numerous offices throughout the United States to serve Vitrecomy patients from coast to coast. We ship Vitrectomy equipment days in advance of surgery to give each patient free time to become familiar with their Vitrectomy equipment. As a courtesy, the rental period for your Macular Hole Recovery Equipment does not begin until the day of surgery. Our offices are staffed with knowledgeable customer service professionals who work with both the patients and physician offices in insurance matters and have experience with many insurance company reimbursement policies including Medicare, Aetna, Blue Cross/Blue Shield, United Health Care, Cigna, AARP Medicare Complete and most other major insurance carriers. 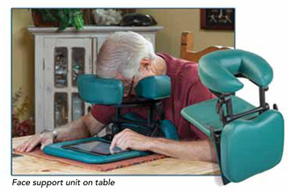 NOTE: Medicare & Medicaid DO NOT cover the cost of facedown vitrectomy equipment rental. All vitrectomy and macular hole rental equipment services (including face down recovery chair, face down face support and accessories) are charged to the patient and are due at the time of services unless other arrangements have been made. The patient is responsible for filing all claim documentation with his or her insurance provider. Comfort Solutions provides all necessary documentation needed to help patients with insurance reimbursement. Please contact us for additional assistance. We Rent Face Down Recovery Equipment Nationwide! We are headquartered in South Florida with locations throughout the United States.